Today we present a guest post from Tony Messer from Pickaweb. Tony is the co-founder and CEO of UK web hosting company Pickaweb. 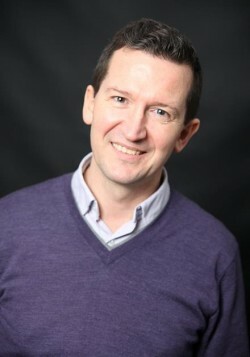 He is also an author and loves helping small businesses, web designers and developers to achieve great things. Connect with him on LinkedIN, Google+ or Twitter. After all, it’s the content that’s driving visitors to your site on a daily basis. And, as a highly effective lead generation strategy, it should be one of the most important components of your overall marketing plan. Having high quality content that drives traffic, engages readers, and increases conversion rates is key to a successful and strategic content marketing approach because it helps build trust and a connection with potential customers. That trust factor is one major factor that drives customers to buy. But with the new highlight and focus on content there are a few challenges as well. Many brands have had to dramatically increase the quality and output of their content in order to keep up with the demand. That means hiring a content marketing team, either in house or virtually. Putting together a content marketing team, sound simple, right? Bang out a few posts, get them up online, set up a few tweets and you’re done. The truth is that good content marketing involves a lot of moving parts and if you want to get results then they all need to be working together smoothly like a well oiled engine. 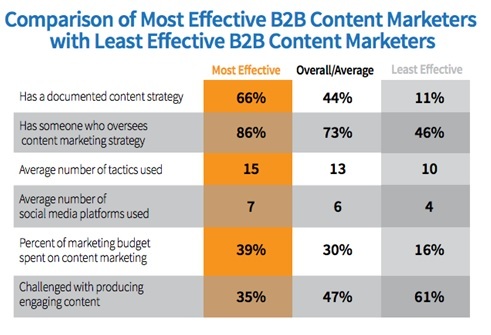 In fact, in a study done by the Content Marketing Institute and MarketingProfs on B2B Content Marketing Trends in North America, it was found that the most successful brands are those that have a dedicated leader who oversees the content marketing strategy. It’s clear that the facts show having a team in place means more success. But, how can you effectively manage a content marketing team if you’re just getting started? We’ve broken down the process into a handful of important factors that, once tackled, will dramatically improve your content management team and increase the quality of their output as well. Creating content isn’t as simple as writing a blog post and calling it a day. A properly run content marketing campaign has quite a few moving parts, regardless where the content is created from, either by a virtual team or in-house. In it, they highlight no less than sixteen (!) 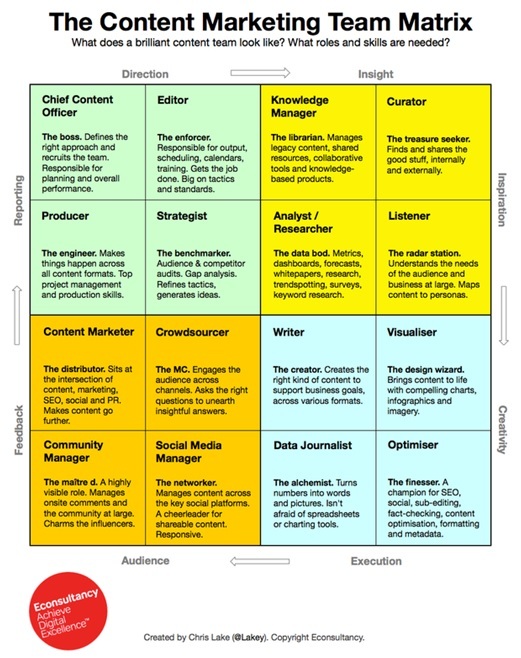 roles that can be played in a content marketing team. OK, that doesn’t necessarily mean you need 16 people, but this highlights not only why it’s so important to have a leader overseeing everything, but also how crucial assigning roles can be. So, the first step is to break down the roles you need for your brand and assign them to specific team members, each of whom is under the leadership and guidance of the overall content marketing manager. Understand which person is going to fill which role. For a smaller brand, you might not need something as in depth or complex as the graphic above, rather you can have one person wearing multiple hats. If your brand is outsourcing the content creation, then you’ll also need to assign roles to the people who are going to manage freelance writers, graphic or visual creators, and the financing or payment of these projects. 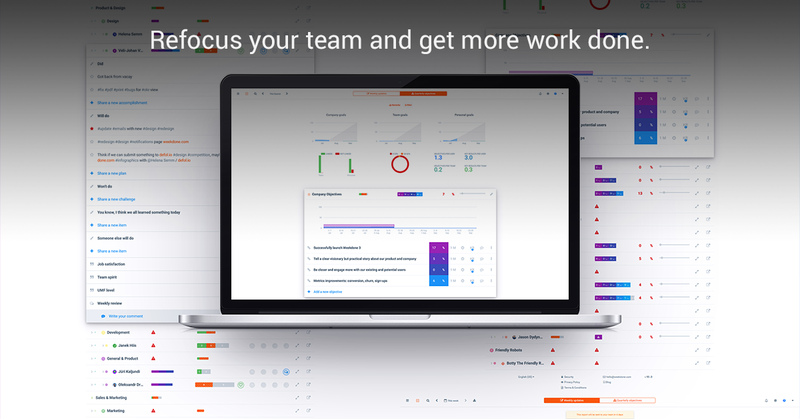 Once you have the team assignments in place, you can move on to the next part of the process. Top brands never create content without a plan first. This means they start with the end in mind, they look at the ideal outcome, what do they want out of a particular piece of content? When we say the ideal outcome, brands consider things like: Do they want to create content that is going to drive traffic to their site? Do they want to have content that is specifically created to increase conversions? Remember, in an ideal world, every piece of content that your team creates has a purpose, it could be to educate the reader and provide them with a lot of value, it could be to get them to engage with your content and take a particular action, it could be to highlight a testimonial from a happy customer on why your product or service is so amazing. So, it’s clear that having a goal in mind is crucial. And depending on what that ideal outcome is, you will need to work with and manage different team members during the creation and distribution process. In this case, your team members are likely going to be more focused on fact gathering, design, and visual creation. So the people who have been assigned these roles know that when an infographic appears in the content calendar, they need to be ready to jump in and get started. This trickles down to your outreach, promotion, and distribution team members as well since specific types of content can (and should) be shared across different channels depending on what it is. So, the key here is to know your content marketing goals from the start. Once you do that, you can have a clear and organized path as it moves from the creation to the distribution stages. Now, how do you keep things organized? There are plenty of ways to get your organization in check. The first place you might want to start is to document your content creation and marketing process, highlighting the roles that will need to be assigned for each goal, and what duties each role is tasked with. Once you’ve got your processes set up and documented, then you can look for the tools that will make the entire content marketing process easier. Thankfully, there are plenty of tools for that! 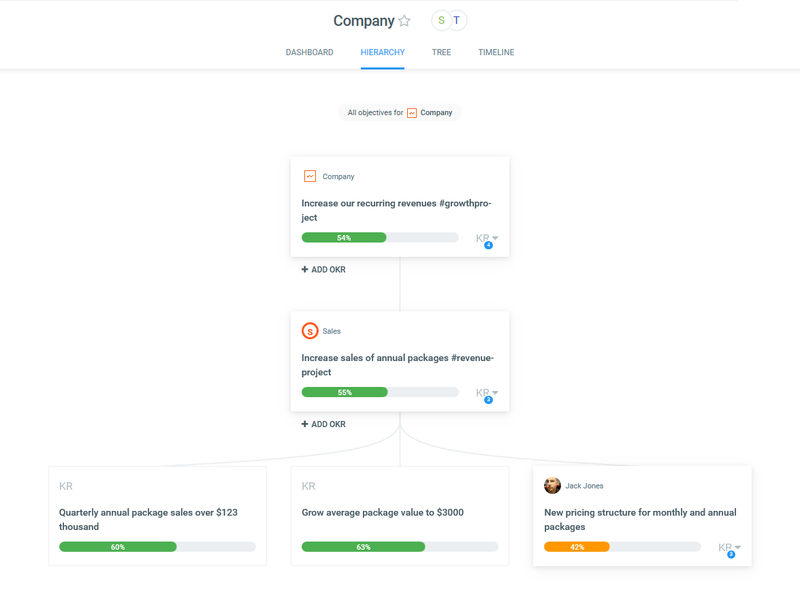 First things first, though, in order to manage the content marketing team well, you absolutely need a workflow management tool. Regardless of how large or small your team is, you can never go wrong with something like Trello to keep your entire team on the same page and organized through every step of the content creation and marketing process. It can be hard to come up with brilliant content ideas that you know will be winners on your own. Instead, look for help from tools like Ahrefs, Moz, or BuzzSumo and see what content is out there in your niche that is already popular, frequently linked, and shared. Few things help to establish great content marketing like a consistent publishing schedule. That way your potential customers can always count on you putting out content they can’t wait to check out. So, your team needs to be on top of exactly when content is scheduled to go, to help use tools like CoSchedule or Kapost (Trello can work for this too). In order to build up your own influence in your niche it’s a great idea to connect with other popular brands, blogs, and social media influencers. It not only can help bring you some credibility, but also get more eyeballs on your content. To find out who your key influencers are check out NinjaOutreach, BuzzStream, or AllTop. No brand should be operating without an email list right now. These are the people who are avid fans and want to hear more from you. Plus, they should be the first people you alert when new content is up and ready to go. In order to level up your email management, consider Aweber, MailChimp, or Constant Contact. The first place most new content should be distributed after it is published is on social media. There, your brand will be able to directly connect with fans and followers. So, it makes sense that in order to optimize this social media distribution, the top brands use a number of automation tools like Buffer, SproutSocial, or Edgar. By now, you should have a very good idea of how you can manage a content marketing team successfully. It takes some work upfront, creating a cohesive team, giving out the proper roles, setting goals, and getting organized to do it, but once everything is in place, the focus of content marketing can be used to amazing effects for your brand. So is Content Marketing something you are doing now or planning to? Do you do it all yourself or do you have a team? Let us have your thoughts below. Remember to follow us on Twitter, Google+ and Facebook for all about management, leadership, Pickaweb and more!